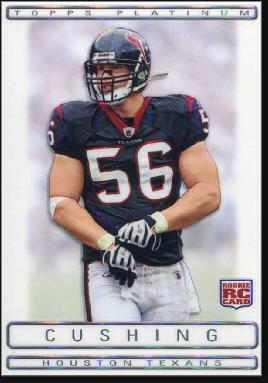 Brian Cushing was born January 24, 1987 in Park Ridge. He grew up in nearby Closter, where he and brother Michael played any game they could think of that involve colliding bodies. Brian ended up becoming an All-American football player, while Michael became an All-American in rugby. Both attended Bergen Catholic High School, where Brian was named North Jersey Player of the Year by the Bergen Record. The Crusaders won a state championship that season, with Brian at running back, tight end and linebacker. Recruited by several major college programs, Brian chose to go cross-country to USC. He saw action at linebacker starting his freshman year. As a sophomore in 2006 he was named Second-Team All-Pac 10 and in 207 was the Defensive MVP of the Rose Bowl—a 32–18 win over Michigan. It was the first of three straight Rose Bowl victories for the Trojans. After earning First-Team All-America recognition as a senior in 2008, Brian was taken by the Houston Texans with the 15th overall pick in the 2009 NFL Draft. Opponents naturally picked on Brian during his rookie year, but did so at their own peril. Twice he was named AFC Defensive Player of the Week, and finished strong as the Defensive Rookie of the Month for both November and December. At season’s end, he was tied with superstar Ray Lewis for the most tackles in the NFL—and was an easy pick for NFL Defensive Rookie of the Year. In the spring of 2010, Brian was surprised to find that he had been found to have higher-than-normal levels of the hCg hormone in his system, which violated the NFLs policy on performance-enhancing drugs. Brian claimed that it might have been related to a potentially cancerous tumor doctors had identified and removed. Nevertheless, he was nailed with a four-game suspension and a re-vote was ordered for Rookie of the Year. Brian was the first player ever subjected to a re-vote. He won the vote anyway. Brian sat out the first four games of the 2010 season. The Texans actually won three of those games, but went into a long mid-season losing streak that saw them go from first to worst, with a 6–10 record. The team’s problems often came down to missing tackles. In 2011, the Texans made Brian a team captain. He earned second-team All-Pro honnors and was Houston's team MVP, racking up 114 tackles and 4 sacks. The Texans clinched their first playoff berth that winter with a 10–6 record. The defeated the bengals in the opening round but lost to the Ravens 20–13 after allowing 17 first-quarter points. With Brian and pass-rusher J.J. Watt lining up together, many experts picked Houston to win the AFC title in 2012. While Watt performed as advertised in his second season, Brian missed half the year with injuries. The team still finished 12–4. However, when Brian again lost significant time to inuries in 2013—this time to a broken leg—the defense unraveled and the Texans fell to 2–14. He bounced back in 2014 and so did Houston. In a game against the Giants, he set a new franchise record with 17 solo tackles. Brian ended up starting 14 games for the Texans, whowent 9–7 and just missed the playoffs. The Texans won their division in 2015, with Brian starting all 16 games. Houston boasted the NFL’s 7th-best defense and Brian led the team with 63 solo tackles and 110 overall. J.J. Watt and Whitney Mercilus combined for nearly 30 sacks. Texans fans hoped the defense would make up for an anemic offense in the playoffs, but it was not to be. They were blown out 30–0 by the Chiefs in the opening round. The Texans made the playoffs again in 2016, finishing in first place in the AFC South with 9 wins. Brian missed three games with a knee injury but was in good shape for Houston’s 27–14 victory over the Raiders in the opening round. The Texans could not get past the Patriots in the Divisional playoffs, howeve. Brian sacked Tom Brady to end a second-quarter drive in a 14–13 game, but it was all New England from there, as the Pats won 34–16.